Each year we have a real jobs board at the camp. We provide markers and large Post-it™ Notes for companies to get a chance at the camp to post their job openings. All Drupal related jobs are encouraged and there is no charge for this during the camp. Jobs posted on the board will be announced over the P.A. system during the camp so as to provide maximum exposure for Drupal jobs in our local area. This weekend the stars align for you and hundreds of other fans of Drupal, the fastest growing Web CMS around! Get ready for the fourth annual DrupalCamp LA all this weekend. Saturday and Sunday, August 7-8, doors open at 8:00AM sharp. DrupalCamp LA is only a week away! With over 50 sessions published this is clearly the Drupal weekend for you! Some exciting news to share with everyone: In addition to our SATURDAY NIGHT PRIVATE PARTY sponsored by MediaTemple, the S.E.O company Volacci is offering all-day training Friday before our camp at an amazing special price for camp attendees! We also need all our session presenters to get ready before the camp (info below). Our awesome DrupalCamp is less than two weeks away! Spanning two days, August 7-8, the city of Irvine will hear the Drupal battle drums overtake their local university. With already over 30 sessions published and hundreds of fellow Drupal users pre-registered for this free event -- this is clearly the Drupal event you won't want to miss! 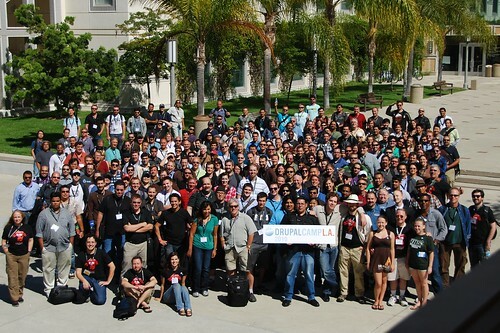 We are happy to announce the fourth annual DrupalCamp LA, which is taking place on August 7-8th, 2010, at UC Irvine. Assuming we lock down enough sponsors, Attendance is free and volunteers are needed. Once you are registered, head over to the sessions page and submit a session idea or pick the sessions that interest you. New sessions will be posted daily until July 31st. The proposed schedule will be announced the week before the camp. Expect registration tables to be open Saturday morning at 8:30AM. Parking is available and costs $8 per day. All the information you need is available on this web site. Presenters, please get ready before the camp by reading this post ASAP. We are in urgent need of sponsorships. Please order a sponsor level today or contact the camp organizers today for any additional details.